The Mad Hatter spends most of his twisted time tea partying with his friends the hare and dormouse. With all that time spent with his tea set, we're wondering if he even gets a chance to taste any of that Earl Grey that's constantly flowing. We're thinking he doesn't at all unless you count the time he dips his pocket watch in there which would give it a strange brassy taste. Well, whether he actually drinks tea or not his tea parties are something we want to be a part of. The dormouse is super adorable, singing, "Twinkle, twinkle, twinkle" over and over again as he sleeps in a teapot. The March Hare is less trustworthy. He's always trying to convince the Mad Hatter to butter his watch to fix the time which is ineffective. It was good butter though, apparently but it turns out that even delicious sandwich spread won't fix technology. Well, it doesn't matter anyway. Everyone is mad in Wonderland! 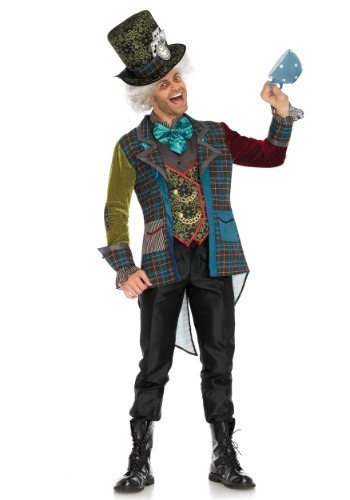 This Mad Hatter costume is ready to make your costume experience extraordinary. Whether you're showing up to the mad tea party in an Alice in Wonderland group costume or you're going insane and solo this topsy-turvy costume is unique. 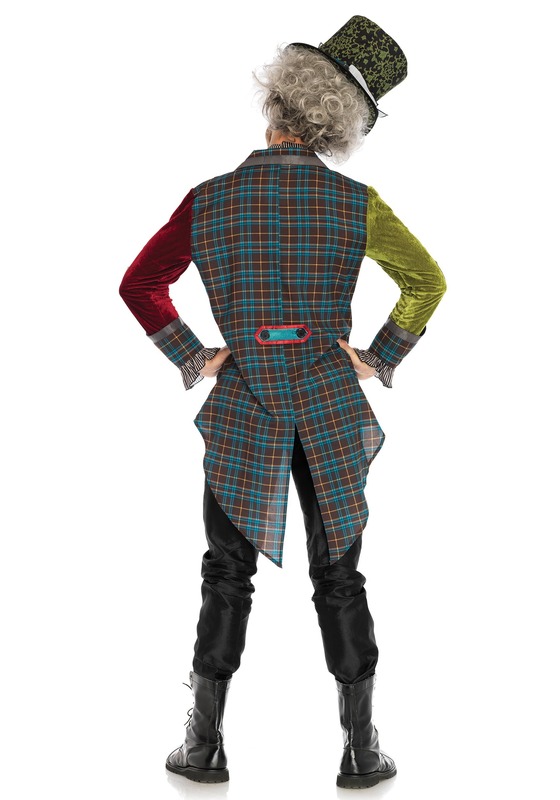 It features a checkered waistcoat with one olive green sleeve and one maroon sleeve and fancy tails. It also includes a chained waistcoat, an attached shiny blue bowtie, and a leafy top hat with a checkered band around the brim. Add on a curly, crazy wig to make the ensemble complete. Finally, a reason to look forward to tea time!